Want a little piece of the CHIX? Have some cheese while listening to our recording "Feta" Accompli or What a Food! 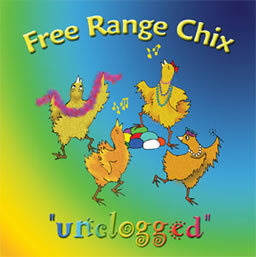 and of course, you can always visit CD Baby for uplifting songs from our Unclogged CD. Here is a partial list of our songs. This fabulous CD is available to purchase through CD Baby for all of your worldwide friends/relatives! It's the perfect gift for all the women in your life - including you! Our GODDESS cd is available by request from this site.